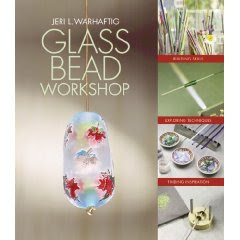 Just when you thought you’d never need another lampworking book, Jeri Warhaftig has come up with one that takes you from the intermediate stage and beyond! There are projects in here that will make you see glass in a whole new way, and will send you running for the torch. Reviewers agree: this is the book for you if you want to make more than dots and swirls. Sandblasting, applying enamel, working off the mandrel, and blowing hollow beads are just a few of the techniques that Jeri will introduce you to, and then inspire you to explore further!